Jorge Masvidal Knocked Darren Till Out In The Heart Of Great Britain!!! 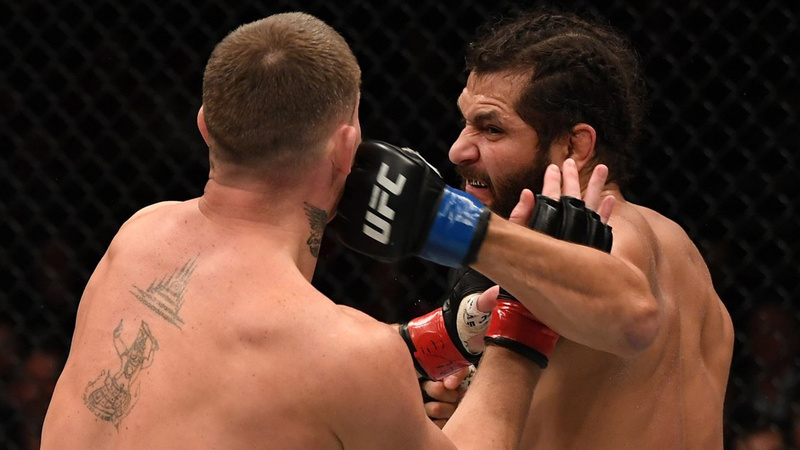 UFC on ESPN+ 5 is headlined by the 170-pound clash between the dangerous striker Darren “The Gorilla” Till and the former vacant AFC Welterweight Championship title holder Jorge Masvidal. It is going down live tonight (Saturday, March 16, 2019) from inside O2 Arena in London, England. The referee in charge for this contest is Marc Goddard. Masvidal runs immediately in, no glove touch, goes for a leg kick, ends up hitting Till between the legs, and a pause is called. Left hand Till, Masvidal tumbles. Till jumps on the top of him, Masvidal is trying to recover. It seems Darren is bleeding, fighters are back on the feet! Till catches the kick, and trips his opponent again. He goes down to Masvidal’s guard, but Jorge controls the position well and gets up. Masvidal throws kicks to the body, and now an inside leg kick. Jorge grabs a single-leg, throws a punch over, Darren defends. Solid left hand Till, Masvidal counters. Till delivers a brutal right hand, followed by 1-2, what a performance. Masvidal firing back, a good left hook. 1-2 Masvidal, Till shakes his head. Till presses Jorge against the fence, 30 seconds left. Fighters separate, Jorge goes forward. The end of the round, very tough to score, I think 10-9 Till. Till goes for an aggressive jab. Masvidal with a great leg kick, counters jab. Masvidal 1-2, but pokes Darren to the eye. The referee calls time. Masvidal goes for a takedown attempt, but Till defends. The two are pressed against the cage now. Till gets of the cage, eats a few dangerous strikes from Jorge. Jab Till, Jorge attacks with the hooks. Body kick Masvidal, Till goes for a left hand. Wow, these counter punches are brutal!!! Till enters right hook and scores. 1-2 combo Masvidal and Till is down! The end of the match, KO win Jorge Masvidal!!! Out of nowhere! It’s all over!!! As advertised. Helluva main event. Rd. 1, Liverpool. Darren Till drops to 17-2-1 MMA, 5-2-1 UFC, Jorge Masvidal improves the score to 33-13 MMA, 10-6 UFC.